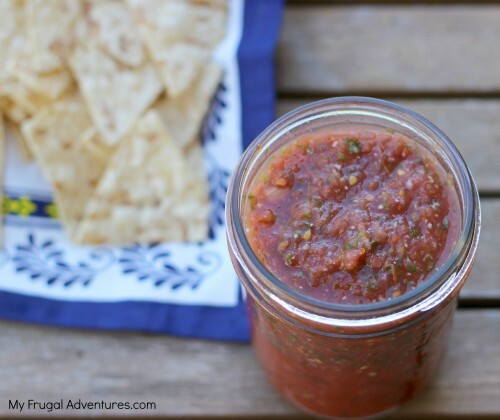 Healthy salsa recipes are one of my favorite ways to introduce new tastes into my diet. Unless you’re well versed in Mexican cuisine, you may think salsa comes in two varieties: red (roja) and green (verde). But really, “salsa” just means “sauce,” and anything goes to put together a delicious salsa. Onions, garlic, and cilantro are the usual base, but get creative. These seven healthy salsa recipes use everything from lentils to cashew, blueberries, and red grapes. If you’re used to just “red and green,” though, don’t worry: there are healthy versions of those staples here for you too. This salsa still has tomatoes, jalapeno, cilantro, and lime, but one additional ingredient makes this salsa super. Lentils are a “superfood,” after all, thanks to a little protein, dietary fiber, and brain-friendly phytonutrients and antioxidants. 1. 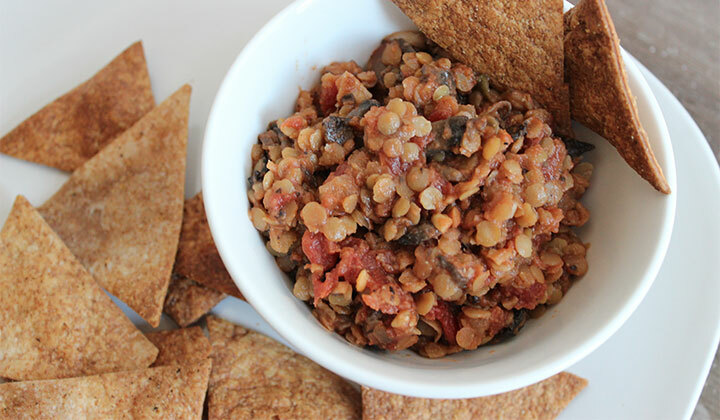 In a large bowl, mix together the lentils, tomatoes, garlic, red onion, cilantro, and jalapeno. 2. Add olive oil, lemon and lime juice, cumin, salt, black pepper, and Tabasco sauce. Stir to coat. 3. Cover the salsa, and allow to chill for at least an hour. Fancy salsas can liven up your old favorites, but sometimes the only thing to satisfy a craving for Mexican food is classic salsa with red tomatoes, garlic, and plenty of fresh cilantro. Don’t rely on the flavorless premade stuff in jars; you can whip this one up from scratch in 5 minutes or less. 1. Roughly chop the tomatoes and onion, and then add to a food processor or blender. Put the garlic and cilantro in too, and pulse a few times. 2. Squeeze the lime juice over top of the salsa, and add cayenne pepper, salt, and other desired seasonings to taste. 3. Add the chile pepper to the mix, and pulse a few more times until the desired consistency is reached. This salsa can do it all: dinner and dessert. Use it to top a juicy chicken breast for a big burst of flavor, or spoon it over sweet corn ice cream for a uniquely cool appetizer or after-dinner treat. 1. 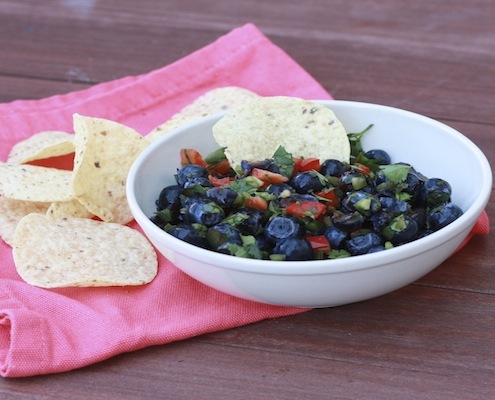 In a large bowl, mix together all of the blueberries, lemon juice, cilantro, peppers, and salt. 2. Salsa can be served immediately, or to further develop the flavors, cover and chill for 8 hours. Can’t decide between guacamole and salsa? 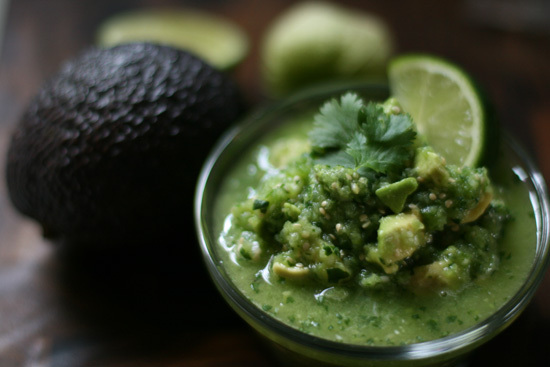 Have a little of both with this recipe, which combines avocado and tomatillo. The two flavors are married together with a classic combo of onion, garlic, jalapenos, cumin, and cilantro. When you need a real crowd pleaser to bring to a party with chips, don’t forget this dip. 1. Preheat the oven to 450°F. On a rimmed baking sheet, arrange the tomatillos, onions, garlic, and jalapenos in a single layer. Drizzle with sunflower oil. Roast for 15 minutes until the skin are starting to look blistered. 2. Cut the jalapenos in half, and scrape out the seeds to discard. This will reduce the spice level of the salsa. 3. In a food processor, add half of the roasted mixtures of tomatillos, onions, garlic, and jalapenos. Pulse until fairly smooth. 3. Add half of the cumin, salt, cilantro, and avocado. Pulse until the avocado is smooth. Taste and add salt if desired. 4. Repeat, blending in the rest of the roasted mixture, followed by the seasonings and avocado. Adjust tartness by adding a splash of lime juice. 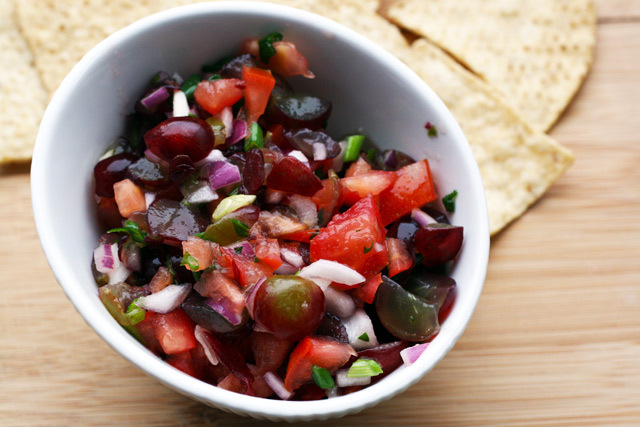 Chances are you’ve had a salsa with grape tomatoes in it, but red grapes as in what goes into red wine? That’s a sweet twist on a classic that you and your whole family will find oddly addictive. Otherwise, the recipe is kept simple with the usual salsa staples. 2. Mix the prepped ingredients together in a medium bowl with lime juice, salt, and hot sauce. 3. Cover the salsa, and allow it to chill overnight, or for at least a half hour. Drain excess liquid before serving with chips or crostini. 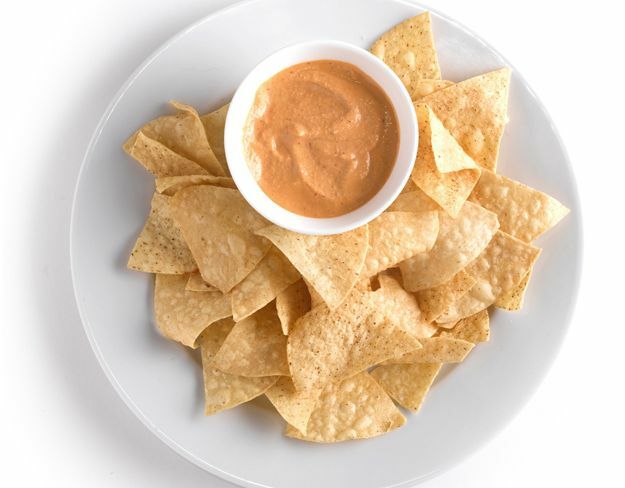 This smooth, creamy salsa is rich and has great depth of flavor from the chipotle peppers. The fat in the cashews helps tame the heat from the chile, and the best part is you only need four ingredients to throw this together. 1. You can skip this step and buy the cashews smoked, but it doesn’t take much equipment. Line the bottom of a large pot with foil, and scatter soaked wood chips over the top. Cover, and heat over medium-high until the chips produce smoke. Arrange cashews in a single layer in a metal steamer basket, and place it inside the pot. Cover, and smoke for 10–15 minutes. Adjust heat as needed to maintain constant smoke from the chips. 2. Once the cashews have cooled completely, puree them in a blender or food processor with the sugar and chiles. Add a tablespoon of water at a time, up to ¾ cup, to reach the desired thickness. 3. Season with salt to taste, and serve. 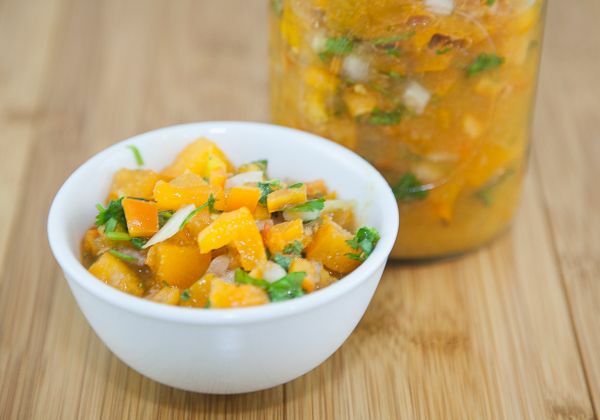 This salsa is so different it seems otherworldly – and it tastes out of this world too. Ginger is a more commonly featured flavor in Asian cuisine, but here it added a little something extra to the smoky chipotle. So as not to overpower those strong flavors, the recipe calls for yellow rather than red tomatoes. I found it in The Great Salsa Book, which has quite a few other eccentric-yet-tasty options, and it’s great with chips, but you can also use it as a garnish for grilled tuna, swordfish, pork, or duck. 1. Add two golden tomatoes, the chipotle chile pepper, and ginger to a food processor. Puree until smooth. 2. Pulse the rest of the salsa together after adding the remaining tomato, roasted garlic, hot sauce, lime juice, sugar, and salt. Keep the salsa fairly chunky. What did you think of these healthy salsa recipes? Have anything else to share? Let me know in the comments below! 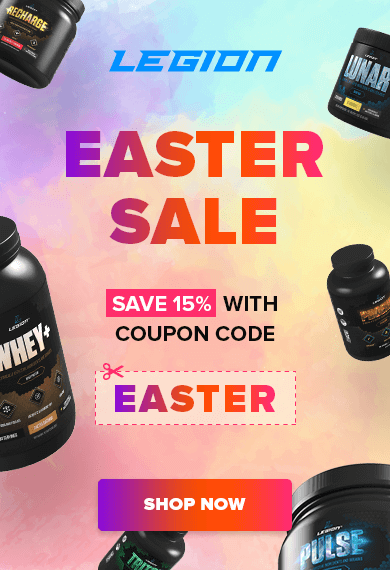 Muscle for Life Success: Nital J.